This month, I made myself keep track of my grocery spending. I used an Excel Spreadsheet, which helped in organizing my spending. Each week, I used my weekly menu to estimate the cost of my upcoming grocery trip in the spreadsheet. I listed items by category: produce, meat, grocery items, dairy, frozen items, and other. Estimating gave me a chance to change my menu and drop items from my list if they sent my estimated cost soaring. After shopping, I would enter the price of each item. If I went to different stores during the week, I listed each store’s shopping in a separate column. Each week, I would create a new sheet in the same document. I also had a sheet that would list my weekly spending by month. I was surprised at the amount I was spending. I was not being very frugal in my grocery choices. The spreadsheet also became a great price book. Each week, I would better be able to estimate costs. I was also more cognizant of prices at the store. For instance, if I estimated spending a certain amount on potatoes, I was more aware of the actual costs, especially if I found a great sale. 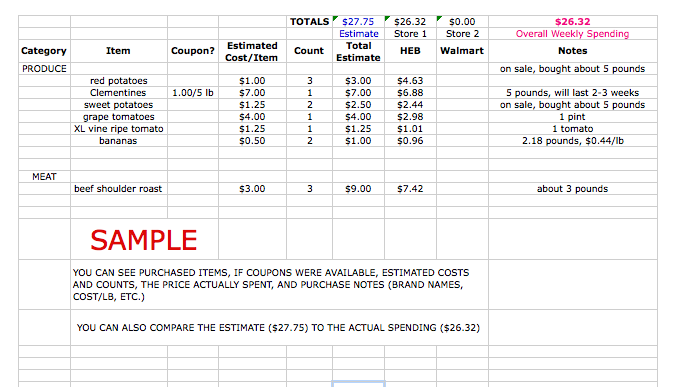 I also liked doing a spreadsheet price book and grocery spending itemization, instead of one on paper. When using a notebook, you have to estimate the number of pages you would need for produce, groceries, meat, etc. By using a spreadsheet, I could adjust the number of rows I needed. If I was purchasing a lot of produce in one week, I could easily add more rows to that section. 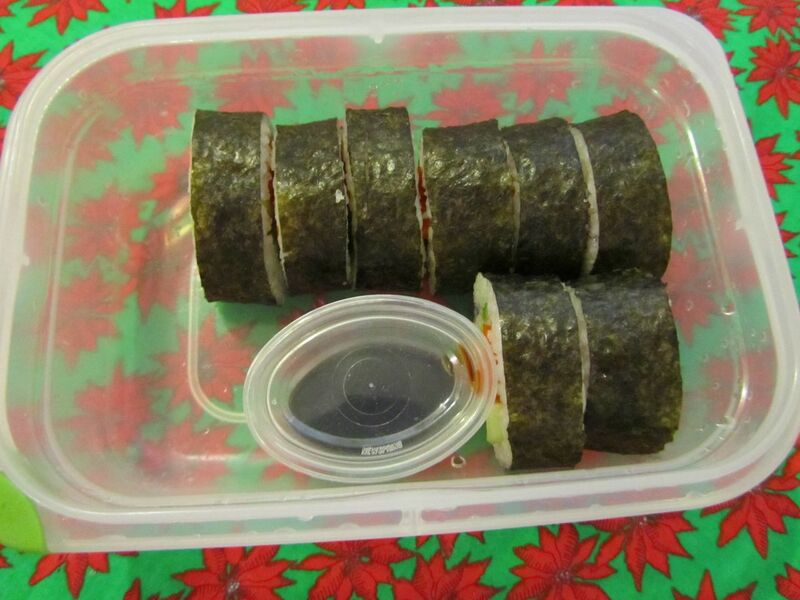 I used my rice cooker to make sushi rice. 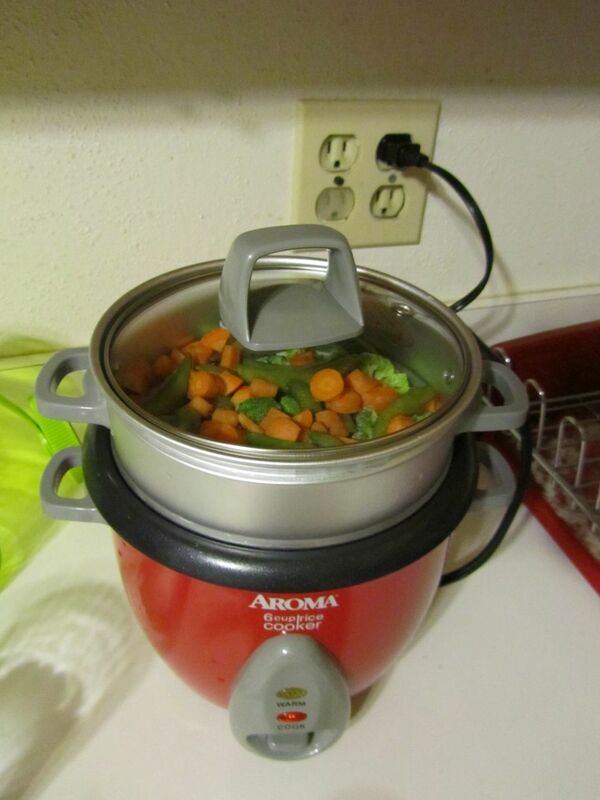 I used 1 cup of rice (the rice cooker comes with a measuring cup) and filled it with water up to Line 1. 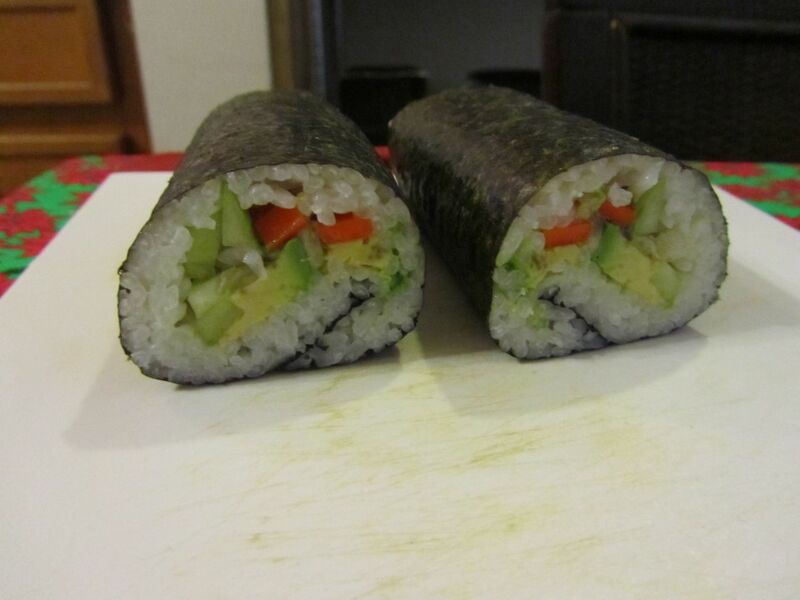 It made enough rice for 2 sushi rolls. 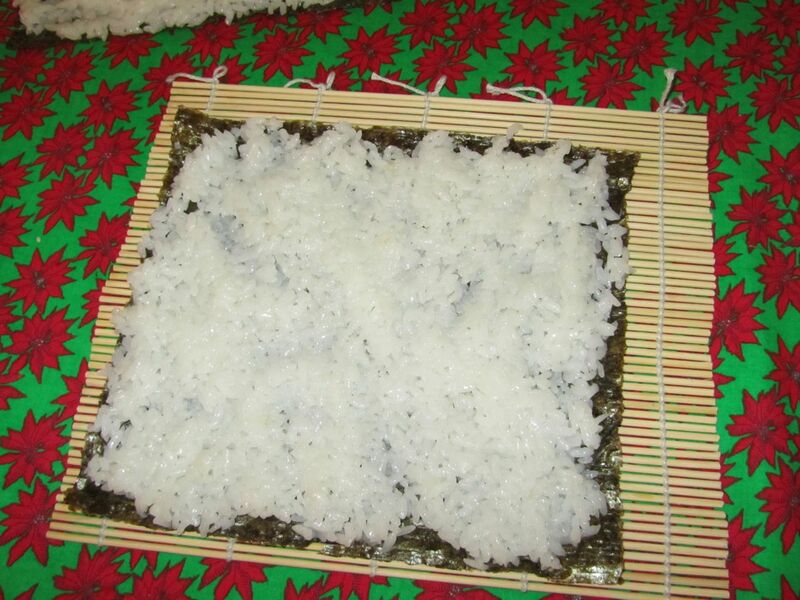 When the rice is done, mix salt (1/2 tsp), sugar (1-1/2 tsp), and rice wine vinegar (1 tbsp). Heat in the microwave 15 seconds to help the sugar and salt dissolve. Add to the cooked rice and stir/slice with the rice paddle (comes with the rice cooker as well) to coat the rice with the mixture. Let cool. 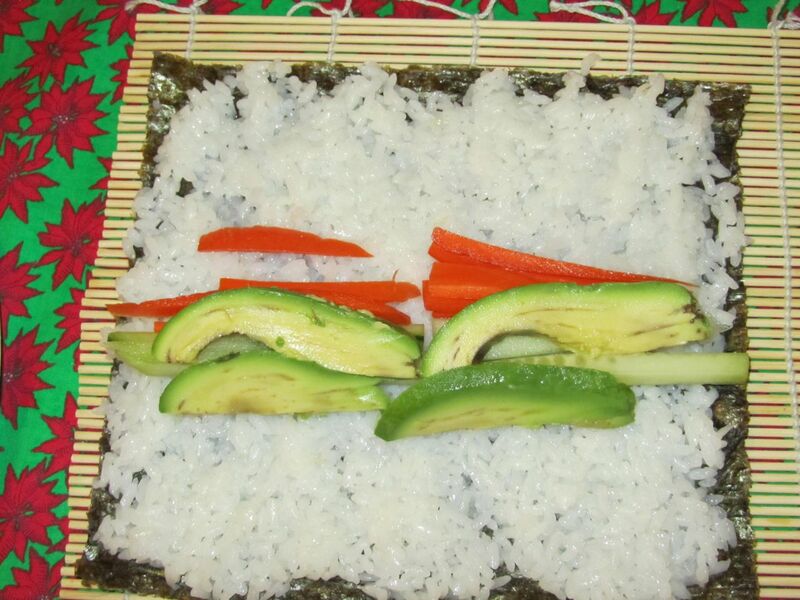 Spread on the seaweed (nori). It helps if you have wet hands. 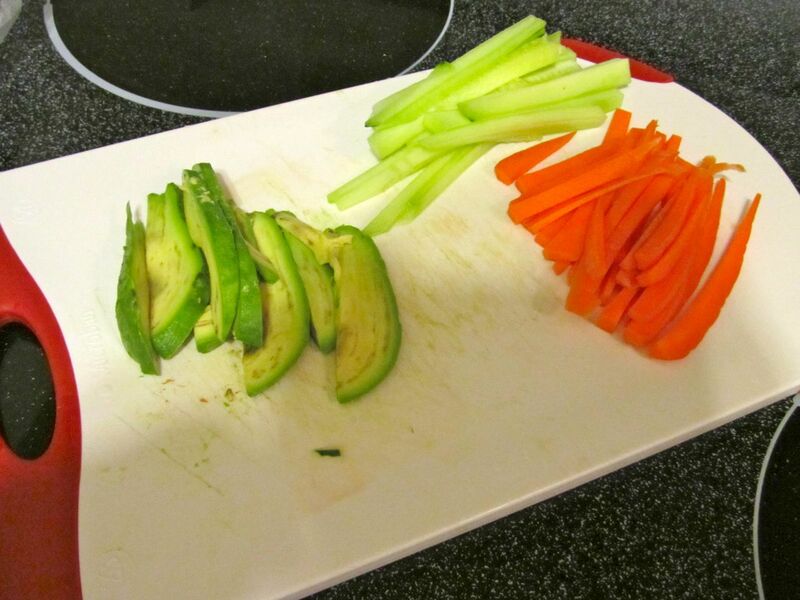 Slice your vegetables in thin strips. I used cucumber, carrot, and avocado. Lay your veggies on the rice. Sprinkle with ground ginger. 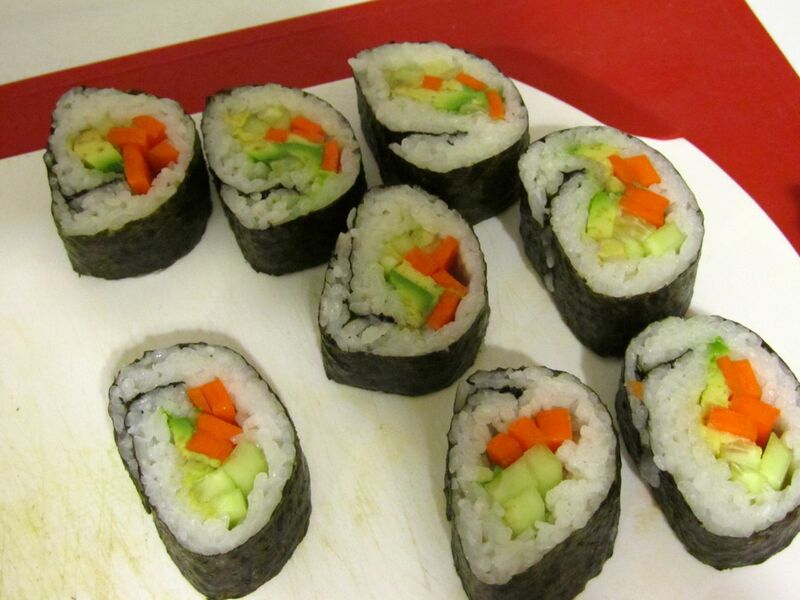 Then, you roll the sushi. Squeeze it tight! 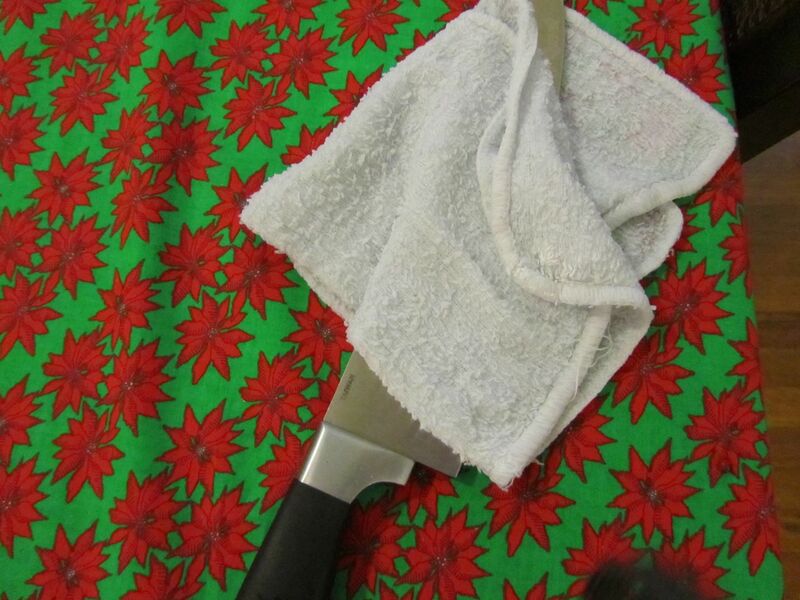 To slice, it helps to wipe your knife with a wet cloth before you slice each piece. You also need to make sure your knife is really sharp. Here’s a view of the inside. Packed for a snack at work the next day, complete with soy sauce. The rice cooker rice was moist the next day. When I would make the rice on the stove, the rice would be hard the next day. The leftover veggie slices are great as a garnish or a snack. Most of our freezes have been right around 32 degrees. 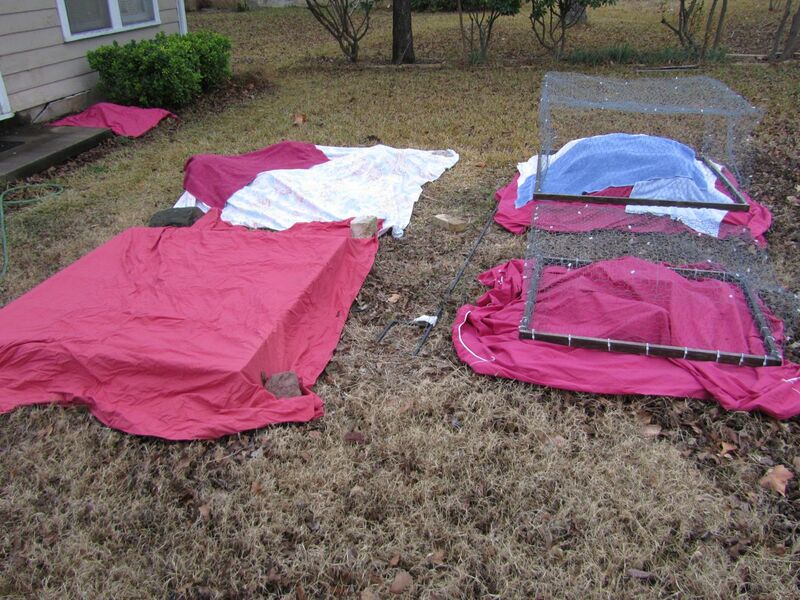 For colder freezes, we’ve thrown some towels on top of the sheets. We use the cages, as well as rocks to keep the sheets from flying away in the wind. I made hummus wraps again (with zucchini, onions, and red bell peppers). Since I didn’t have access to spinach or lettuce (way too cold to go outside for some), I used some swiss chard I’d picked from my garden the previous day. I’ve never cooked swiss chard, let alone eaten any (except for trying a piece raw from the garden, which I didn’t enjoy — salty?). 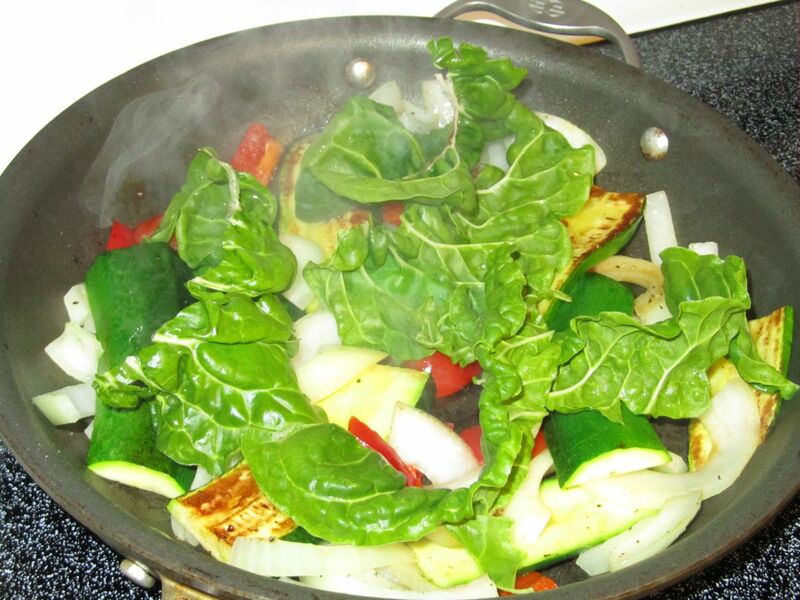 Anyways, I put a couple swiss chard leaves in the pan with the veggies (cook 4 min., turn the zucchini over, cook 4 more min.). Here’s a picture of what it looked like when cooked. 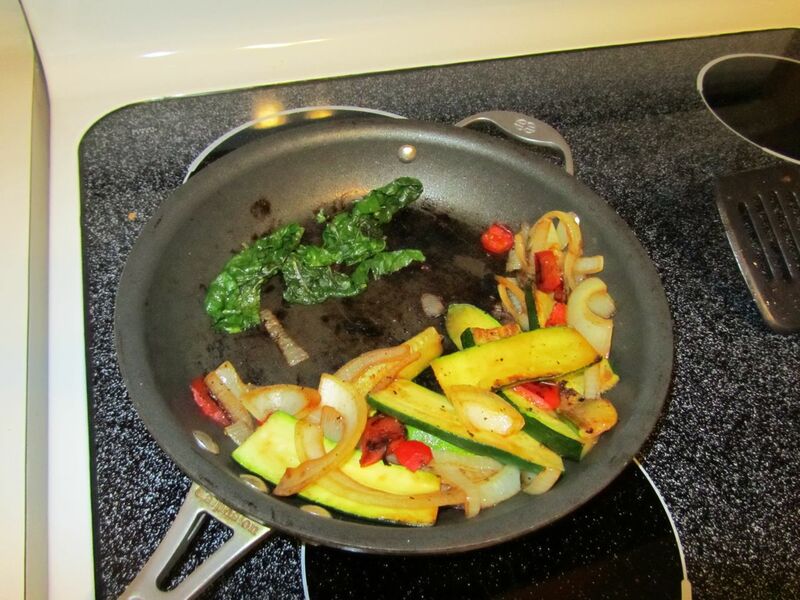 When the main veggies were done, I moved them to the side but let the swiss chard continue cooking a bit longer. I tried a piece of the swiss chard right after it finished cooking and it was really tasty. The hummus wrap (I ate it for lunch) was super tasty, especially warmed up in the microwave for one minute. To make the hummus wrap, I spread hummus on a burrito-sized tortilla, and then added half of the veggie mixture (pictured above). This is the most productive box right now (above). We have broccoli (I recently cut several broccoli heads off of the plants), as well as a variety of types of lettuces. 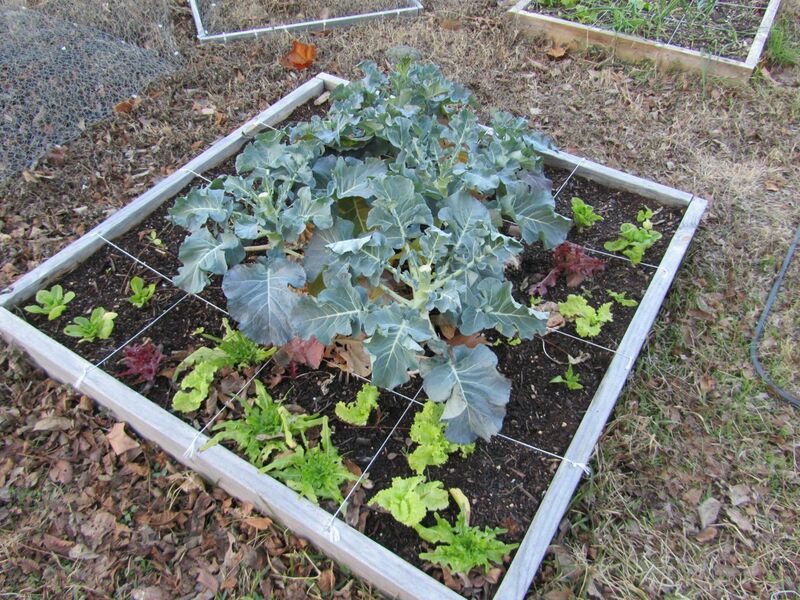 There’s a farmers’ mix, romaine, and butterhead. I’m guessing that they’re growing close to the ground due to the cold. I’ve been getting a salad or two out of them every week or so. This box has swiss chard (some leaves were recently picked) and some onions. 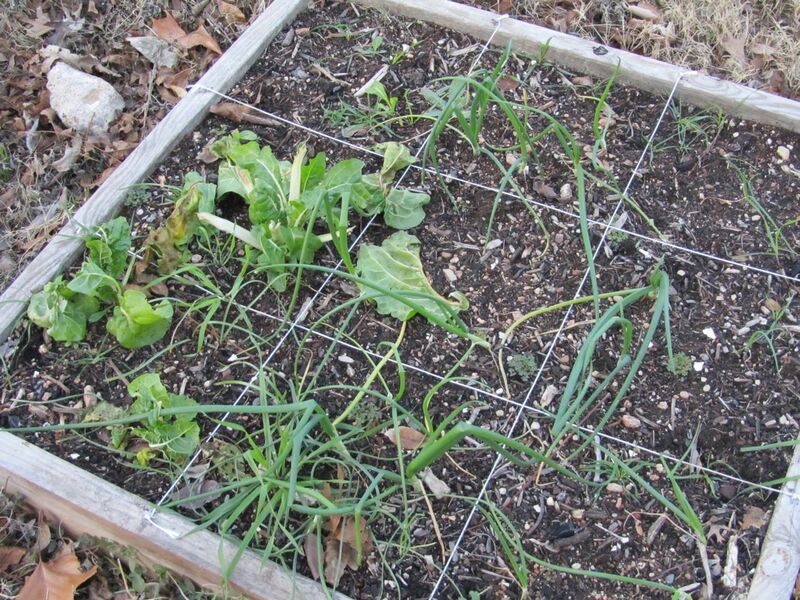 The onions won’t be ready for a while. 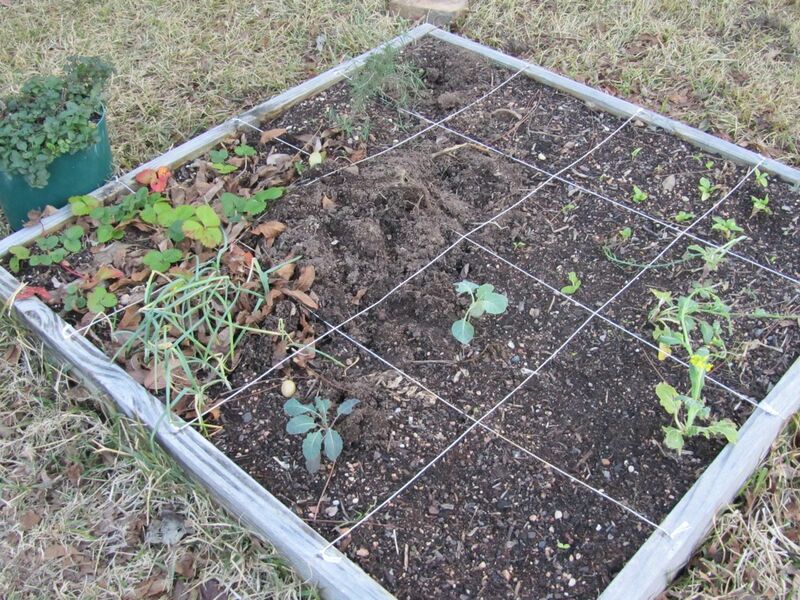 This is where the potatoes and carrots used to be. There are still some leeks (left side). 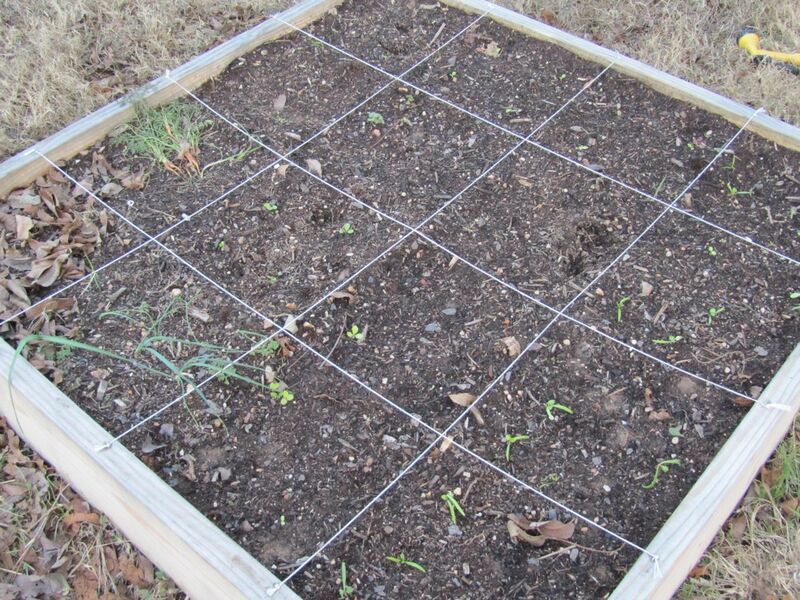 I also planted some spinach and lettuce. You can see the spinach coming up at the bottom of the photo. This box has strawberries (not producing right now), multiplying onions, rosemary, oregano (in the pot), and some very small spinach, kale, collard greens, and possibly bok choy. The greens in this box kept getting eaten by something, and they never really grew very large. I’m doing a research course for one of my classes this semester. It involves learning how to do research, as well as reading lots of research articles. Everything I’ve read so far has taken forever to read, because I don’t know what half the words mean. A principle axis factor analysis with promax rotation yielded the cleanest factor structure. Eigenvalues and scree plots suggested that four factors be extracted from the data. Care to know how many words from that I actually understand? Why is it vegetarian and not vegan? I used oyster sauce. Mmmm! 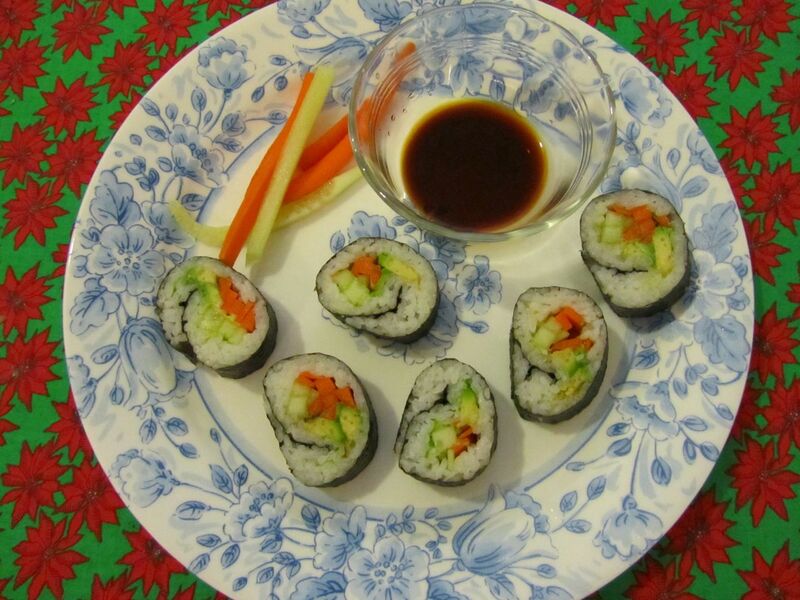 This was the first recipe I cooked in my new rice cooker. 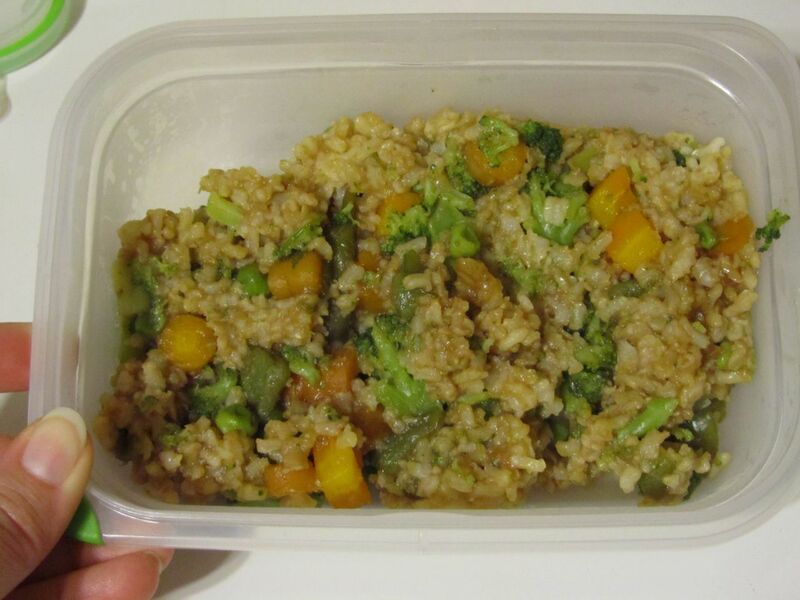 I put instant brown rice in the bottom, and veggies (carrots from the garden, broccoli, and sugar snap peas) in the top. The rice and veggies cooked at the same time. When the rice finished cooking (the machine went from cook to warm), I unplugged the machine, stirred the rice, dumped the veggies in, and added soy sauce and oyster sauce. This is probably a healthier fried rice than restaurants, because I didn’t use any oil.